Norman Rockwell was America's favorite illustrator. Not just a flash in a pan, either. From his first appearance on the cover of the Saturday Evening Post in 1916 through his final publication appearing on the Post cover in 1963 and beyond, he delighted his viewers, frustrated his critics and tickled the collective American funny bone for most of his life. Rockwell painted life as he wished it really was: happy children, engaged parents and grandparents, good clean fun. He had the ability to take an ordinary situation and make it seem extraordinary. Rockwell's artwork was almost always topical in nature, pointing to some current event and taking a playful look at it from a unique angle or perspective. Even his more serious topics, such as his Four Freedoms series of paintings during World War Two, demonstrated his unique perspective and wit. 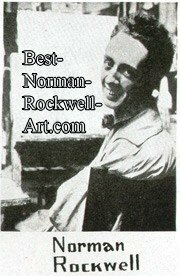 Best Norman Rockwell Art is your online source for information and resources on America's favorite illustrator. Here you can find information on specific paintings, indulging your eyes and imagination all the while. You will also find helpful tips for selecting and storing your precious and valuable Rockwell collectibles. NOTICE: Our content is constantly revised and updated so check back regularly for the latest information. Our site contains over 400 pages of content covering Rockwell's artwork. The best way to find the specific information you are looking for is to use the Google search box at the bottom of the home page. Or use the Site Search button from the navigation menu which is available from any page. When you mention Norman Rockwell art, America immediately leaps to mind. America's foremost illustrator, Rockwell is best known for capturing the essence of the American experience. For over forty-five years, Rockwell entertained America on the cover of the Saturday Evening Post with his humor and wit. Even longer than that was his career and contributions to other magazines that began with such as early favorites like Boys' Life, The Literary Digest, The Country Gentleman, Life and Farm And Fireside. Later publications that featured Rockwell's art were Look, where his more serious minded compositions on civil rights and space were published, and McCalls, Family Circle and TV Guide. Even more expansive that his magazine cover publications was his advertising and book and story illustration catalogue. It has been estimated that he painted more than 4000 paintings in his lifetime. What is really amazing about that number is that there were a large number of really insightful and artistically significant works in that career output. History will no doubt record Rockwell as one of the great American painters, even if he did refer to hinself as "only" an illustrator. Rockwell has sometimes been criticized as being too sentimental with his art. What that really means is that his illustrations often showed the true emotions and humor of his subject matter. I agree, as I'm sure you will also after you explore these pages. Best Norman Rockwell Art is dedicated to all things Rockwell. I collect it. I appreciate it. And I share it here on these pages. From his early Saturday Evening Post covers, advertisements, book illustrations and Boy Scout illustrations to his more recent work where he tackled complex social issues, you will get the full scoop here. No Rockwell Art is on sale here. But I have found and experienced some of the best sources. For some hard to find items, I have found the only sources. Whether you are looking for a Norman Rockwell poster or a Norman Rockwell print, you'll find honest recommendations of the best sources right here. There is nothing better for making your schedule than a Norman Rockwell Calendar. Art and function, all rolled into one. Who could ask for more? If you want to look your best in a Norman Rockwell scarf or shawl or a Norman Rockwell necktie, I will point you in the right direction. If you need Norman Rockwell collector plates or Norman Rockwell figurines to finish or highlight your collection, you are starting in the right place. Your showcase will thank you for starting your search here. For those truly remarkable collectors, if you are looking for an original Rockwell painting, there are also reliable sources for you on the web. Stuck for ideas for the holidays? Nothing says special like a Norman Rockwell Christmas or Thanksgiving painting. As you will see, this resource is maintained by a true Rockwell collector and lover. Enjoy your visit and please come back as often as you like. A complete list of Norman Rockwell magazine covers, part 5, starts in 1924 and continues through 1939. Come see several more favorites of Norman Rockwell Santa Claus paintings. Explanation of Copyright Issues for Public Domain Works. Norman Rockwell Biography, page 2, focuses on 1918 to 1936. Norman Rockwell Biography, page 3, focuses on 1938 to 1953. Norman Rockwell Biography, page 4, focuses on 1953 to 1978. Sitemap of Best-Norman-Rockwell-Art.com, page 2. 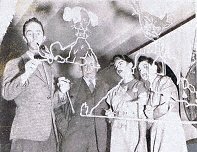 Sitemap of Best-Norman-Rockwell-Art.com, page 3. Sitemap of Best-Norman-Rockwell-Art.com, page 4.